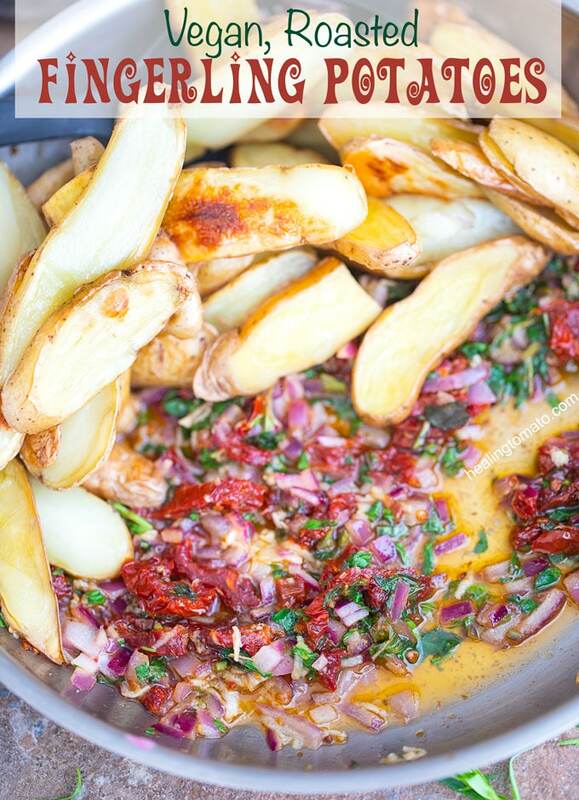 Roasted fingerling potatoes in a rich vegan butter sauce with sun-dried tomatoes, onions and fresh oregano. This is how potatoes are done!! Make this a side dish or eat it by itself. They are simply irresistible. Can you taste the delicious sun-dried tomatoes just by looking at this picture? I am droooooling just by looking at this photo! More than ever before, I really wish we had smell-o-vision, so, you could inhale the wonderful aroma coming out of my kitchen when I was making these amazing potatoes! To get the maximum flavor of each potato, cut the fingerling potatoes lengthwise! Don’t cut them into rounds or cubes because you won’t be able to taste the potatoes. Once I figured out the best method to cook them, the next step was, “how long to roast fingerling potatoes”. The right answer is slowly and surely! I set preheated the oven to 400° before putting the potatoes into it. I very lightly oiled them before spreading them out on a baking dish. They are were in a single layer so that they all got roasted evenly. The fingerling potatoes were roasting in the oven for forty minutes at 400°. Roasting them slowly made them really crispy. Keep your oven temperature at 400 and remove them when they pass the knife test. Can you believe that they are all vegan? Who says that vegan food is not rich and comforting? I used vegan butter because I really wanted to make this a meal that everyone can share. 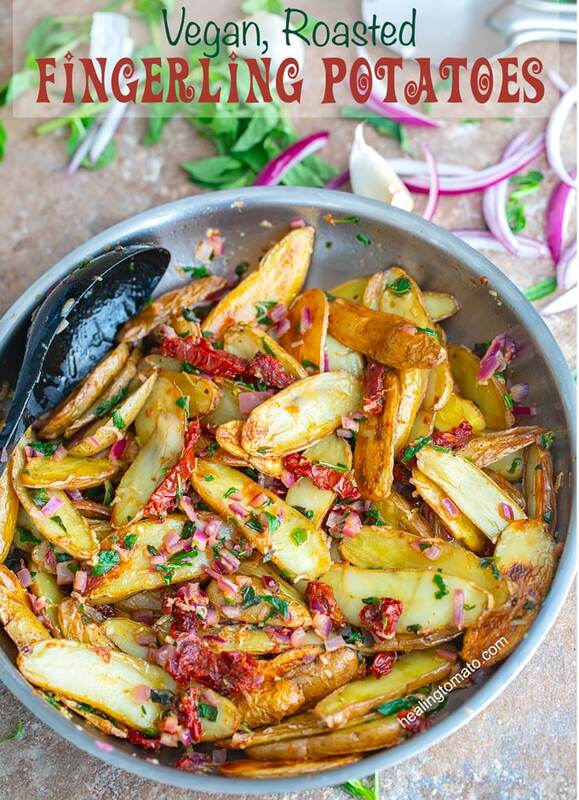 Vegans, vegetarians and meat eaters cannot resist these colorful potatoes! Recently, I used a rich vegan butter sauce in my casarecce pasta and it was beyond delicious. I realized that this was a good way to flavor meals without having to work too hard. On days when I am short on time, I can whip these up in 30 minutes or less. 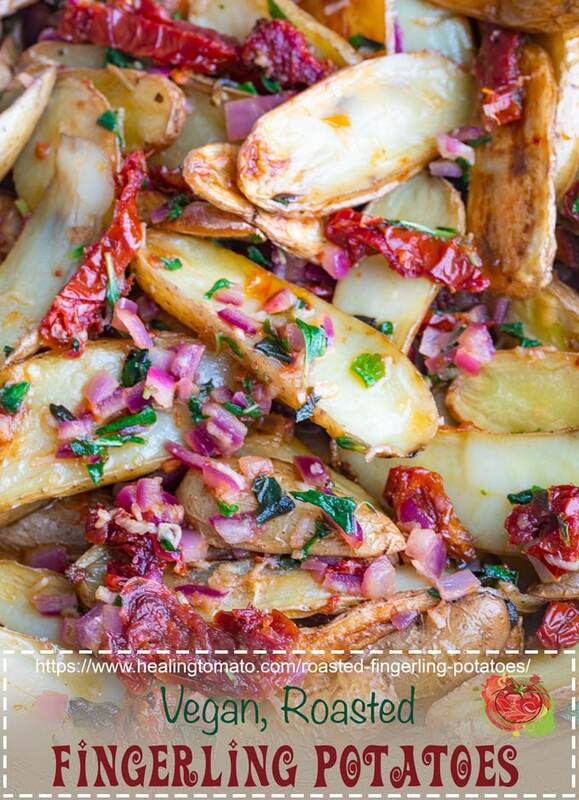 The key to these fingerling potatoes are the sun-dried tomatoes. Instead of getting dry sun-dried tomatoes, I went with sun-dried tomatoes marinated in oil and Italian herbs. I used (affiliate link) California Sun Dry Sun-dried tomatoes (julienne cut). These sun-dried tomatoes are so flavorful and versatile, they can be used in any recipe. 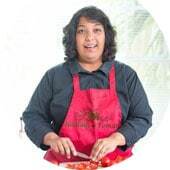 Soon, I am going to post a couscous recipe which used these tomatoes. Trust me, you will love them! 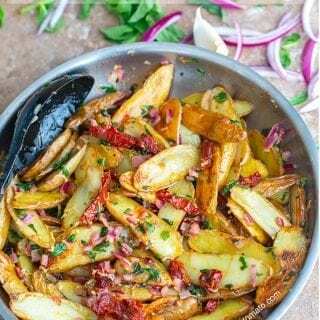 I had initially bought these fingerling potatoes for my skillet sweet potatoes recipe, but, realized that they would taste better in a recipe without any sauce. and wanted to see what to make with them. Since they were so easy to work with, I just had to make another recipe with them as the stars! So, my main dilemma in this recipe was, “How to cook fingerling potatoes?” I tried baking the fingerling potatoes before adding them in this recipe and it wasn’t good. It turned out a little mushy which is never good. I also fried them but that was just a giant oily mess! It was one of those cases where all I could taste were the oils and no other flavors came through. 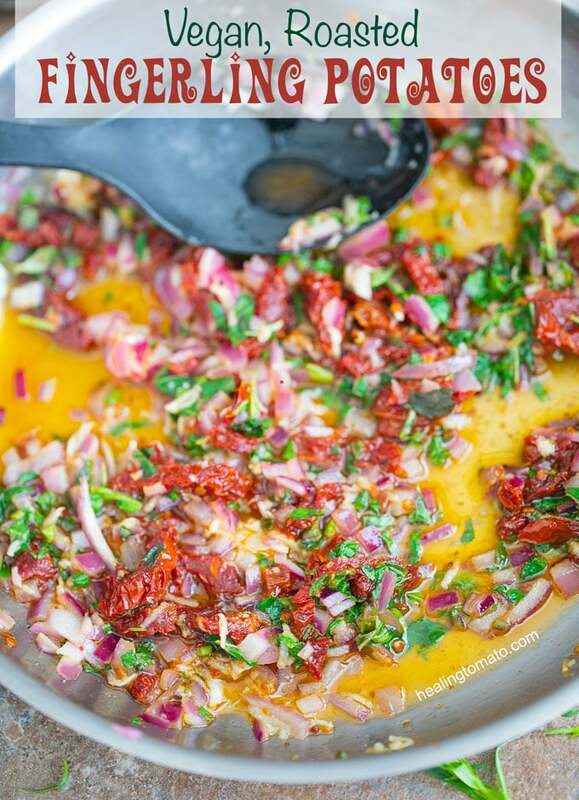 If I can’t taste the yummy sun-dried tomatoes in this recipe, it’s goes in the FAIL pile! The best way to cook fingerling potatoes was to roast them. Oven roasted fingerling potatoes are crispy, yet, delicate. The rich garlic butter sauce has no problem blending with these crispy fingerling potatoes. They are not dry or mushy which is exactly what I wanted from this recipe. Have you checked out my 5 tips on how to bake the perfect sweet potato post? Its my fool-proof way of baking the most delicious sweet potatoes ever. 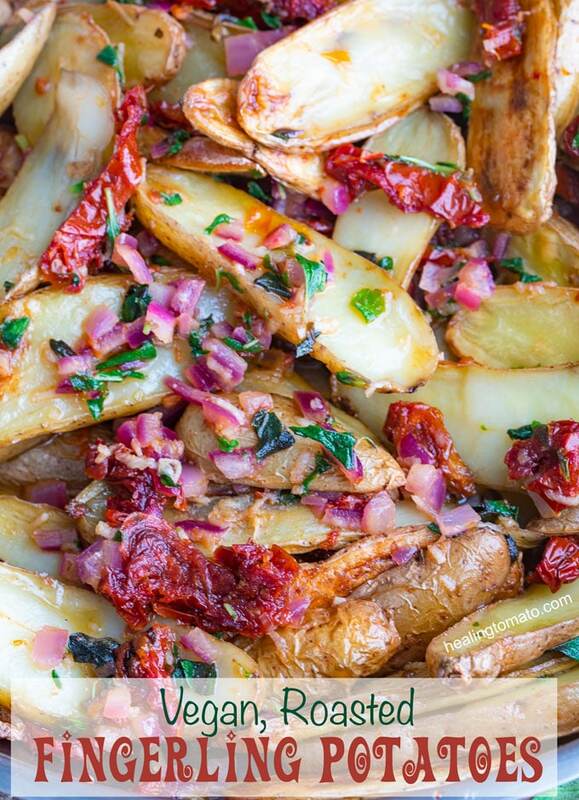 What meal will be the perfect accompaniment to these oven roasted fingerling potatoes? Knife test is when you pierce the potatoes with the tip of the knife. If the tip pierces the potatoes easily and comes out with a little bit of potato stuck on the tip, it means that the potatoes are ready.